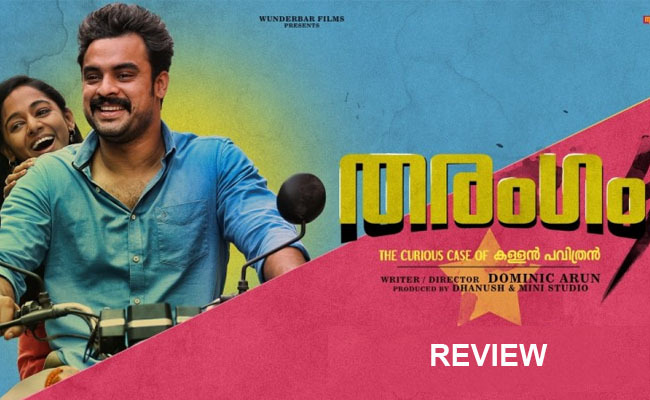 Tharangam could appeal you at many levels – take it as a simple story with non linear narrative pattern or see it as a fantasy entertainer or you can even go and watch it as a comic crime thriller. In all the cases, Tharangam has significantly left its mark. However, the lack of a neat execution ensured that it hasn’t reached the list of content oriented films which are highly entertaining. First of all we have two friends, SI Padmanabhan Pillai, aka Pappan (Tovino Thomas) and Civil Police officer Joy (Balu Varghese) – both under suspension for some reasons – taking some odd responsibilities to solve their problems. Well, uncoiling one problem lands them in an even bigger issue. Tharangam is all about the duo’s journey to solve their everlasting list of problems. As is the case with Tharangam, the movie has incorporated the elements of fantasy with the plot and throughout the movie, we can see director Arun Dominic trying to paint various aspects of life. What makes the movie to have a soul is the level of effort taken by Arun Dominic in giving details to the characters. He seems to have given equal or more importance to character detailing in comparison to that of the storyline. Be it Pappan, Joy, Omana or Malini, all of them exhibits traits, which are unique for them. Another area in which Tharangam wins our heart is the level of unpredictability which it offers throughout the movie. Amidst all these good points, some grey shades did pops up at regular intervals. While the pre interval session was indeed an enjoyable ride, post interval, it was a different story. With back to back confusions taking place, we were taken to the days of slapstick humourous situations. Tharangam also set back us in terms of not maintaining the curiosity level towards the end portions. While the casting all looked good enough, had if they gone for some minor changes, it would have been an even better output. As far as performances are concerned, the movie did boast a good lineup of artists, who are fresh and energetic. Tovino’s Pappan act one again underlines the kind of talent which he possess, while Balu Varghese excelled in his pats. Neha Iyer did a great job as Omana and Tharangam could really boast for finding out this talented actress. Similar was the case with Shanthi Balachandran. Be it Shammi Thilakan, Manoj K Jayan, Dileesh Pothen, Vijayaraghavan and to name all, they all charmed the big screen with some striking performances. Into the technical aspects, the movie heavily relied on the narrative pattern and full credit goes to Arun Dominic in bridging the loose ends, though it was far from perfect. Ashwin Renju’s music was in tandem with the mood of the movie, while Deepak D Menon did a good job while wielding the camera. All in all, though with its share of deficiencies, Tharangam needs to be applauded for its attempt.